Every year at Waybright, we train one to two robotics teams to compete in the FIRST Lego League (FLL) Robotics competition. During the training session, team members work with experienced tutors to develop their competition skills and delve deeper into programming, engineering, problem solving, and teamwork. Students who have worked with us in the past or have been recognized as team players are invited to join. If you haven't been invited and would like to be considered, ask us for the application. 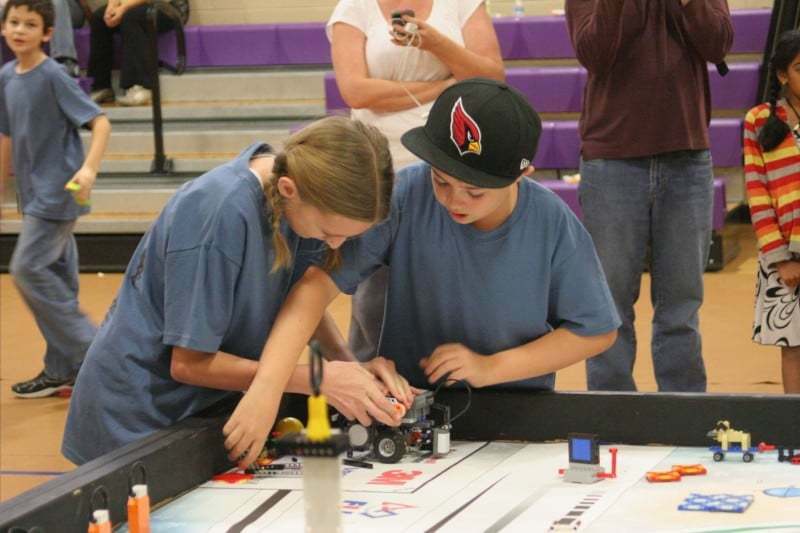 FIRST Lego League hosts worldwide robotics competitions for kids in ages 9-14. The Regional Competition, which we will attend, invites the two top scoring teams to state, then on to nationals. The competition consists of three categories that teams are scored on: the robotics challenge, project, and core values. In the robotics challenge, the team must must design, build, program an autonomous robot using LEGO MINDSTORMS®, then compete on a table-top playing field. In addition to learning programming skills, they must problem solve to find the best way to rack up points within a time limit. For the project, teams must research a real-world problem such as food safety, recycling, energy, etc., and are challenged to develop a solution. Our coaches will guide the students on proper research and project building practices. To enrich our team's project and experience, we ask that they find an expert in the field, and reach out to have a discussion. In the past, we've discussed with firefighters, scientists, and more! The last element of scoring is Core Values, a set of protocols that develops teamwork, good sportsmanship, and mutual respect. It is the foundation of the FLL Competition, and we incorporate these concepts into our meetings. Team members will often engage in team building activities and challenges, which develop strong friendships between members. This is a meeting to learn all about the competition, and what to expect once your child is on the team. All are welcome to attend. Students can bring homework, play on computers, socialize or begin work on the competition. On this day, all of the challenge information begins, and teams can formally begin preparing for the competition. The date will be determined once it is released by FLL. Below is a comprehensive list of meeting dates/times. The team will meet every Thursday from 5:30 - 7:30 pm, and every Saturday from 4:00 - 6:00 pm. We do not meet on federal holidays or breaks. If we're closed on a meeting day (such as Fall Break), that meeting day is rescheduled for a different date. Dates with no meeting are signified by an asterisk. For veteran teams, extra work hours are offered. If the team makes it to state, keep in mind that additional meetings will be scheduled. A one time registration fee of $200 per family is due when your child has accepted their invitation as a part of the Waybright Team. There are two payment methods for tuition: installments and pay in full. You can pay with the method that works for you. Tuition payments include: 4 hours of guided technical training or lessons per week, a one time parent information meeting, official competition supplies and specialty parts and pieces, Regional Competition entrance fees and registrations, a team shirt custom designed each year for the children, a work binder for the season and open work time for veteran team members as it applies. Per hour, tuition is at least 50% less than what is charged in our courses. There is also the extra benefit of the time spent outside of lessons working towards team efforts, setting up systems and support. What is open work time?This is extra and optional work time, in addition to the four hours per week that the children are attending in lessons, that students may be able to come into the office and work, at no extra charge. It is offered only to students who have competed before (or are part of the veteran team) and at the Coaches suggestion and/or approval. Parents are often able to schedule extra time by coordinating this with Management on a case by case basis. Join the team officially by purchasing the one-time registration fee. There are two methods of payment either in four equal installments or in full. The first installment at minimum is due on the day of the Parent Information on September 6th. Customers paying in full receive 10% off the cost of the tuition. The installment method includes four equal payments of $275.